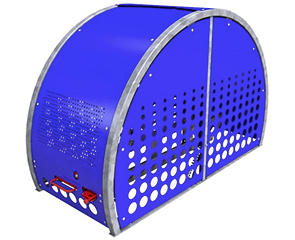 The one-of-a-kind Veloport™ bike locker combines modern style, technology with commercial grade materials to create secure, enclosed bike parking. Designed for ease of use, the locker offers interior and exterior locking points, a hassle-free lift-assist door and all-steel bike tray. The powder-coated, 12-gauge aluminum lift-assist door smoothly opens, closes and locks—secured via U-Lock/padlock handle or optional keyed lock. Engineered with a 2"Sq. 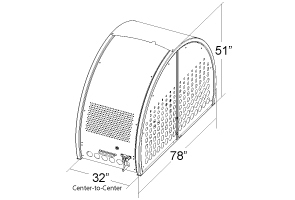 14-gauge galvanized steel tube frame provides superior structural support for the powder-coated 18-gauge steel side and back panels and curved aluminum door. Uniquely styled with aesthetics and functionality, the door and sides display laser cut ventilation holes to help offer temperature control, protection and visibility. Secure and visible, the modular Veloport™ enclosed bike lockers are ideal for secure bike parking on college campuses, office parking garages, amusement areas and more! Standard Locker Numbers are assigned sequentially starting from '0001' to correspond with key number unless custom option is selected.